Peppa Pig Strawberry Adventures - Help Peppa Pig bring home as many strawberries! Collect them all and in the end you get a large piece of strawberry cake! 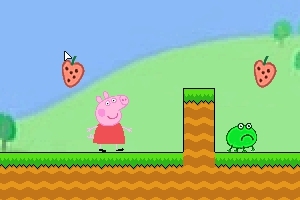 Please comment and visit my website at http://4gameground.com/peppa-pig-game/ to see the game. The first level ran pretty well, but every time I got to the second level, the framerate dropped to the point that it was unplayable. Maybe it's just my computer/browser.